Based on the video below, it it looks like it runs like a dog. On top of that, the thing is.... well, not exactly attractive. See for yourself in the hands on below, courtesy of Netbooknews. 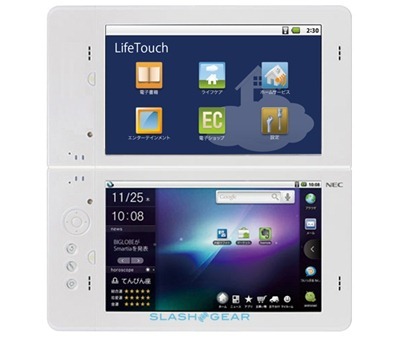 NEC has emailed PC World to let them know that they'll be at CES with a new variant of the LifeTouch - this one with dual 7" screens. Based on the information we have, the only other known change will be the addition of 3G. The mockup done by SlashGear makes it look like they're basically just slapping two of them together and calling it a day, but they're just going by the PC World article, so who knows.